BACKGROUND: The federal government is Monetarily Sovereign. It issues its sovereign currency, the dollar. It never can run short of its sovereign currency. Even if the federal government were to collect $0 taxes, it could continue paying dollars for goods and services, forever. Paying dollars for things is the method by which the federal government creates new dollars. You, your local and state governments, and all businesses, are monetarily NON-sovereign. The dollar is not your sovereign currency. In fact, you do not have a sovereign currency. So you, your local and state government, and all businesses can, and sometimes do, run short of dollars. Keep the above in mind as you read about yet another, in a long list of cases, where ignorance of Monetary Sovereignty, causes the public blissfully to accept unnecessary reductions in government benefits. I live part-time, in the Chicago area, close to many public parks. The city alone has 570 parks, occupying many thousands of acres. The suburbs offer additional thousands of park acres. Virtually all of these parks are free to visitors. The question of the day: If local governments, all of which have limited funds, provide free parks, why does the national government, which has unlimited funds, charge for visiting national parks? If you assume that anything the Trump administration does is bad, you will be right more often than not. But there is the occasional surprising exception. The administration’s proposal to raise entrance fees at 17 popular national parks is proof that even the worst presidents can’t always be wrong. They may forget that this approach didn’t start with Donald Trump. Democratic President Jimmy Carter liked the idea. It also found champions in President Bill Clinton, another Democrat, and his interior secretary, Bruce Babbitt, who had been president of the League of Conservation Voters. In short, bad ideas are not exclusive to one party or one President. The ignorance of federal financing (Monetary Sovereignty) is promulgated by all sides. It would be nice if visits cost nothing. Under this plan, critics should be glad to know, 299 of 417 national park sites would remain free. Not only that, but the higher fees at the 17 parks would apply only during the busiest five-month stretch of the year. Anyone unwilling or unable to pay could visit the Grand Canyon in October or Acadia in May. There are also a number of free days each year. Nor would the change be a huge obstacle to locals who make frequent use of nearby national parks. An $80 annual pass provides unlimited access to every national park site in the country. Yes, indeed it would be nice if visits cost nothing. And it also is nice that 299 national parks are free to visitors. And it is nice that at 17 parks, fees don’t apply during the seven, least popular months. If all these things are “nice,” why do 118 national parks charge any fees at all? Writing recently in The New York Times, Timothy Egan took the contrary view that “all national parks should be free.” But free for whom? Someone has to furnish the money required to run and maintain these vast sites, which last year endured the wear and tear of 330 million visitors. Most of the National Park Service budget, which exceeds $3 billion a year, comes from taxpayers. The new charges would raise a mere $70 million a year. And there, folks, you have a statement of the “Big Lie,” that federal taxes fund federal spending. It is an insidiously believable lie because it sounds so familiar. After all, your city and state do need to receive dollars in order to spend dollars. And businesses do need an income of dollars so they can spend dollars. And you need a source of dollars for spending. So “obviously” the federal government also needs an income of dollars. Except it doesn’t. Being uniquely Monetarily Sovereign, the creator and issuer of dollars does not need to take dollars from anyone. The federal government doesn’t need to tax. It doesn’t need to borrow. It doesn’t need to charge fees. It’s entirely fair to expect all taxpayers to contribute to preserving these priceless treasures, which belong to everyone. But it’s also fair to ask those who actually venture into them to kick in a bit more. No, it isn’t “fair” at all. Not only is it misguided, but it’s an unnecessary burden on the poorest among us, who suffer for every penny they spend. The money goes to a good cause — those roads, trails, bridges, campgrounds, water systems and visitors centers that make the parks accessible and enjoyable. Federal law directs 80 percent of the revenue from entrance fees to the park where they were collected. Right now, the maintenance backlog on park infrastructure totals nearly $12 billion. The extra income at the gate could only help. Outrageous lies. The money goes nowhere. Not to a good cause, or a bad cause, or any other cause. State and local tax dollars first are deposited in private banks, and then are spent. During that time they remain as part of the nation’s money supply. Federal taxes cease to be a part of any money supply, the instant they are received by the government. In short, they are destroyed. They no longer exist. If you ask economists, “How much money does the federal government have?” they will be unable to tell you. The question is nonsensical, because the government has the infinite ability to create its sovereign dollars from thin air, simply by paying bills. It’s like asking, “How many thoughts do you have?” or, “How many numbers are there?” Nonsensical. One objection to the fees is that they would discourage people from coming. But fees were raised in 2015, and the number of visits last year was 11 percent higher than in 2014. The misleading statement is that unnecessarily taxing people is O.K. because more people are willing to pay the tax. No, it’s never O.K. to take dollars from the economy. 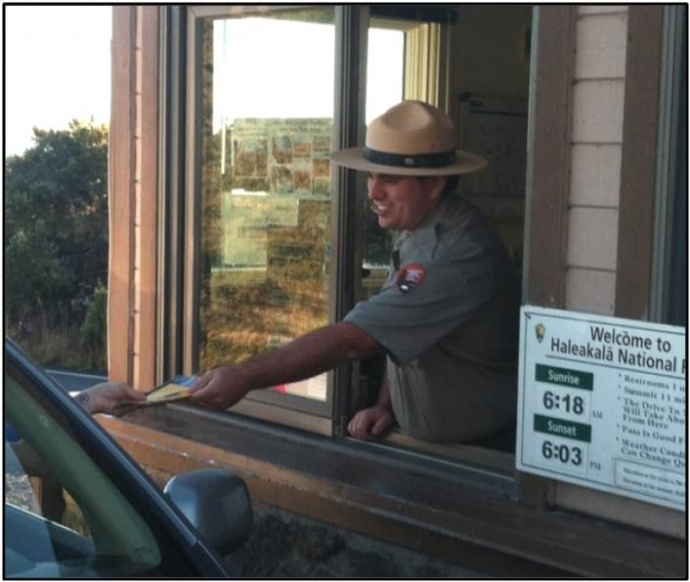 Entrance fees at the national park are the rare tax that people will travel thousands of miles to pay. A truly misleading statement. People don’t travel thousands of miles in order to pay a tax. It’s another unwelcome cost — an unnecessary cost, in this case — of a vacation. The Trump administration has many bad ideas when it comes to preserving the environment and protecting national treasures. This isn’t one of them. In summary, you are told the Monetarily Sovereign federal government is just like monetarily non-sovereign state and local governments. But there is a diametric difference between Monetary Sovereignty and monetary non-sovereignty. Only the U.S. government has the unlimited ability to create its sovereign currency, the dollar. All other entities are limited in their ability to create dollars. Taxes are a burden on the public and on the economy. They remove dollars from the economy, and therefore are recessive. They punish the poorer among us more than the richer. They widen the Gap between the rich and the rest. Even small taxes contribute to the “death of a thousand cuts” created by federal tax laws. People like Steve Chapman help disseminate the Big Lie that damages you and your country. If you look up the word, “tax,” you’ll find such synonyms as “deadweight,” “excess baggage,” “hardship,” “hindrance,” “millstone,” “misfortune,” “obstruction,” and “punishment.” They are especially appropriate for federal taxes. The next time you plop down your $30 (per car) to enter Yellowstone National Park, know this. The $30 did is much to support Yellowstone as would the same $30 tossed into Old Faithful — in short, nothing. Not only is it a waste of your money, but it takes $30 out of the economy. 2 Responses to Why do you pay to visit a national park? Well said, as usual. Did you send this to Mr.Chapman, and did he ignore it? But you can try sending it, too. Perhaps the 2nd time will be the charm.